Last year was all about Scandinavian-style clogs and PVC sandals, but it's 2019 now, baby, and we're ready for a whole new shoe wardrobe. Or, OK, at least one or two trendy new pairs. The stylists at Zappos gave us their top six predictions to scoop up now and wear all the way through the rest of the year. Cozy earth tones, organic materials, cork or wood heels and woven details are giving basic neutral shoes a major upgrade for 2019. Pairs perfectly with your favorite bell-bottoms or a flowy midi skirt. Think of this as the easiest way to add instant edge to any outfit. Pair these puppies with jeans and a sweater, or even mix them with other low-key prints like florals or stripes. By now, we pretty much just consider leopard to be another neutral hue. But zebra, tiger and even cow prints have been popping up on our Insta feeds with greater and greater frequency. Now is the time to build a shoe collection worthy of Noah’s ark. It’s the trend that just keeps on giving. 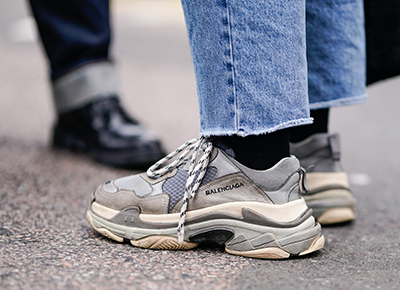 Comfortable sneakers of almost any and every variety are still going strong. But chunky soles, multiple saturated hues and sock-like fits are especially of the moment. Be sure to pick up a shoe cleaning kit so they can continue to look just as fresh as the day you bought them.